With one of the oldest names in golf, Wilson irons have used all manner of alpha-numeric combinations to designate their clubs over the years. The Wilson X-31 may sound a little more like rocket or aircraft designation than a golf club, but make no mistake; these clubs were "the real deal" back in their day. The X-31 originally appeared in the 1950s and was of a design common to the era: a muscle back iron with smooth lines, small heads, and fitted with steel shafts, while the accompanying woods had heads of solid maple. Generally these were made as a department or sporting goods store set -- rather than something you would find at your pro shop. This was an era when Sam Snead and Patty Berg were actively designing on the Wilson Tour Staff, and their names were most often attached to a mass-market set of clubs. While the X-31 bears neither of their names, the concept is indelible, and the frequency with which these '50s-era sets or individual clubs can be found -- even today -- speaks to the thousands of sets made and sold. Like many companies, Wilson has used the X-31 model for years, and throughout the 1970s and even into the mid 1980s it remained largely unchanged. A hard-to-hit (by today's standards) iron with a very small sweet-spot, no offset, and no cavity back or perimeter weighting. I played a similar set (Wilson Staff Tour blades) in the late 1980's and can testify that nothing feels as good as as well struck iron shot with a forged club -- and nothing feels worse than a poorly struck one. The problem for me was, far too many of the latter and not nearly enough of the former. Wilson has recently resurrected the X-31 mark yet again, and once more applied it to their department store sets that are sold complete with irons, woods, and bag, and geared at the beginning or very casual golfer, just as they were over 60 years ago. Today's X-31 features game improvement technology such as cavity back irons, large, forgiving wood heads, and a shaft flex best suited to the beginning player. I’m not a big fan of this set for a few reasons. It’s not any better than your basic Wal-Mart set. Most of the full sets that are out there right now are cheap and ugly. It’s designed to look like the better equipment but the materials are shoddy. I wouldn’t use these shafts in my broom. The driver head is oversized (which is good) but the sound it makes at impact rivals nails on a chalk board. And the shaft of the driver is whippier than a riding crop. If you want a cheap set that you only pull out once or twice a year, then by all means grab this set. 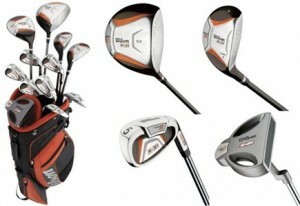 However, if you are interested in getting into golf and playing this wonderful game for a lifetime, than check out the Adam’s A7 OS hybrid set. This is an awesome set for beginners (and intermediates). These hybrids let you enjoy hitting the golf ball right out of the gate and the materials and technology allows you some room to grow. You will have this set with you for a long time. Wilson X31 was my first golf set. I learned to play game with these clubs over 20 yrs ago. And more importantly, I learned proper golf striking with the small narrow forged club face on the mid = long irons. It’s true the clubs are unforgiving when struck off the sweet spot. But no better motivation in duplicating a shot when it’s hit dead center. I still have my X31 set and take ‘em out for a practice round(s) every time my game is tanking. We got your company information through an exhaustive search in the directories.We are authorized government/Business agent based in Ministry of Endowment and Islamic Affairs,the Islamic State of Qatar.There is an ongoing offer for the supply of your products to the Government of Islamic State of Qatar under the Ministry of Endowment and Islamic Affairs project procurement division and in a large quantity for their ongoing rehabilitation and promotional project in the countries. I am an agent and my interest for every business I do is my commission and as a commission agent . Your products are needed by the Qatar Government on contract supply basis through the Central Tender Committee (CTC). Payment of every government contract in Qatar is by 100% bank swift transfer (TT) in advance immediately every contract formality is completed. We are respectfully inquiring if your company will be interested to supply your products to the government of Qatar on contract basis with us as the intermediary agent? If this proposal is of interest to your highly esteemed company,please reply us by providing your company price list and catalog for quotation.